Last week I mentioned that targeted offers for Amex Delta Skymiles cards can be found at www.deltaamexcard.com. After entering my Skymiles # and last name, I was offered the Delta Gold Amex ($95 annual fee/waived first year) with 50,000 Skymiles (for spending $1,000 in the first 90 days) and a $50 statement credit for your first purchase $50+ Delta purchase using the card. That's substantially better than the best public offer on Delta.com or Americanexpress.com. I don't have any Delta travel coming up, but I recently read that Delta is now selling electronic giftcards. On a whim, I decided to check to see if purchasing a Delta e-gift card would trigger the $50 statement credit. I purchased the e-cert on Friday and today the credit posted! Now I just have to remember to use the e-cert to pay the taxes and fees on my next Delta award flight. P.S. : Based on this experiment, I believe that e-cert purchases would count for the Amex Platinum $200 annual airline credit. UPDATE: Thanks to DeltaGoldFlyer's comment, I see that Rene over at DeltaPoints has confirmed that $50 Delta E-gift cards qualify for the Plat. credit! Two Cheers for Delta Skymiles! and their new earning structure is really bad for frequent flyers who pay for travel. It appears that there's even more reason for Gary to call Delta miles Skypesos. And yet, Delta is still my go to program. That's partially because I'm based in the South and have long been captive to Delta's Atlanta hub. It also helps that Delta is one of the better programs (in my experience) for shoulder-season transatlantic (TATL) business ("O class") class travel. But I have access to AA/US through MGM and UA through BHM, and I still value Skymiles above AAdvantage Miles, Dividend Miles, or Mileage Plus Miles. Why is that? Because I hate, hate, hate, paying out the nose for "free" tickets. I'm currently trying to book some TATL award travel for the Christmas season. Both Delta and AA have business class availability, but AA's primary TATL partner is British Airways, and BA charges exorbitant taxes and fuel surcharges. A TATL roundtrip in O would run 100K miles plus nearly $1000. By contrast a similar Delta itinerary is pricing out at 125K miles plus less than $100 in taxes and fees. 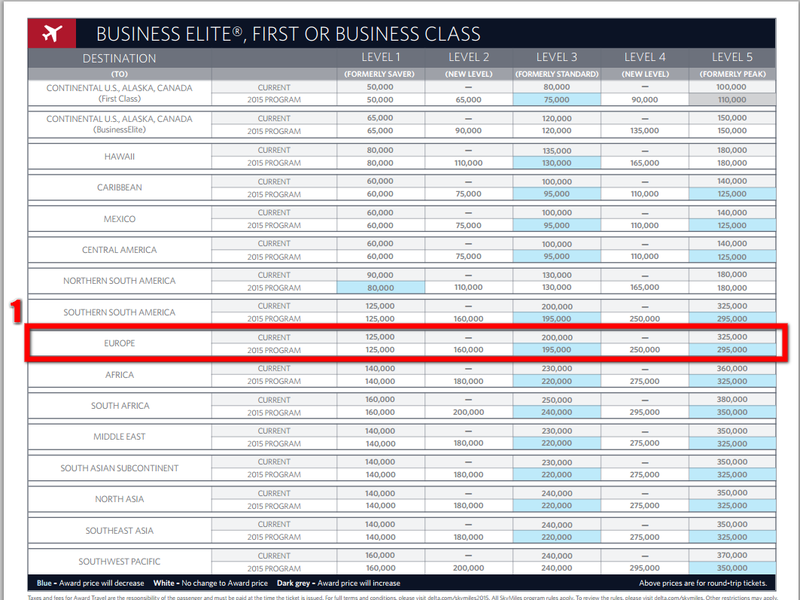 US used to be a decent option for TATL travel with Lufthansa, but now that they've left the Star Alliance and joined Oneworld, US partner award travel will be hit with the same fuel surcharges that plague AA. The entire goal of my points and miles strategy is to avoid (or at least minimize) the need to pay out of pocket for travel. Paying 100K miles plus $1,000 might objectively be a really good deal for a ticket that could cost $6-8,000, but subjectively it's a terrible deal because I'd never pay $8K in the first place. Sure, I could pay taxes and fees with a travel cashback card (like the Arrival or Venture cards), but I'd rather use points from those programs to pay for hotels or other travel expenses. I also end up using Delta a lot because their miles are pretty easy to get. Delta is a transfer partner with Amex Membership Rewards, and there are a lot of ways to earn MR points pretty cheaply. Amex also offers three different Delta Skymiles cards (though you can only have one at a time) and there are pretty good targeted signup offers available. I applied through www.deltaamexcard.com and received a signup offer of no annual fee for the first year, 50,000 Skymiles for spending $1,000 in the first 90 days, and $50 statement credit. That beats the current offer on Delta's website by 20,000 miles. I've previously discussed the benefits of using credit cards to purchase prepaid debit cards. Now, I'd like to share a cautionary tale from Flyertalk. ma91mph posted an example of losing (temporarily, one hopes) the funds on two of his cards after they were refunded to the card through a failed billpay transaction. The takeaway is that if you pursue this route, it's important to keep your receipts and your used cards. Even after you think you've used the card up, it could be important to prove that you purchased it. Big tip of the hat to The Frequent Miler. I've mentioned American Express' "Sync" offers here before. Amex frequently offers some really great discounts (in the form of automatic statement credits) for places that I regularly shop. For instance, they are currently offering $10 off a $50 purchase at Lowes. The trick is that the Amex website will only allow you to sign up for these offers for your primary user card. If you want to sign up authorized users, you need a work-around. Twitter works great for this because if you sync an Amex card to your Twitter account, you can sign up for many of the Sync offers by tweeting a specific hashtag (#AmexLowes, for example). The trouble is that you can only sync one card per account. So naturally, I set up 8 different Twitter accounts for each of my primary and authorized user accounts. There was still a bit of effort, but in a matter of minutes, I could sign up every card I controlled for any particular Sync offer. I thought I was being very clever, but some others had me beat. As TFM points out, you can use TweetDeck (a Twitter service) to send out identical tweets from every Twitter account you control! That means one sign in, one tweet, and you can sign up 8 (or 10 or 12) Amex cards for any Sync offer that's available on Twitter. Sweet! Suntrust Delta Debit Card Going Away? A guy I know earned over 20,000 Skymiles in April. Even with the devaluation of Skymiles, that is pretty good earning. However, it appears that this opportunity is going fast. According to Gary at View from the Wing, Suntrust seems to have pulled it's links to apply for the card. Some people are still reporting success by applying in person or by phone, however. If you have ever considered getting this card, DO IT NOW! Edit: The number at this LINK has been reported to work for signing up. To briefly explain to those who may wonder what I'm talking about, Manufactured Spending is a term coined to describe ways to spend money on credit cards without actually incurring credit card debt. In the glory days, it involved buying actual dollars from the United States Mint with a credit card and depositing those dollars into your bank account to pay off your credit card bill. Nowadays, it mostly consists of purchasing prepaid gift cards and reload cards, liquidating those cards through various means, and using the proceeds to pay off your credit card bill. Manufactured spending has proven useful for meeting initial spend requirements for many credit card bonus offers and, in many cases, as a means for effectively purchasing miles or points at a very low cost. In the past few days there's been a tremendous kerfluffle in the miles & points world regarding the possibility that a national drug store chain will stop allowing customers to purchase a particular reload card with their credit cards. This "crisis" has generated a over 500 (ed: 503!) page thread on Flyertalk. The thread is full of much wailing and gnashing of teeth over the possibility that the cards will no longer be available. But here's the thing: this is no surprise. Manufactured spending opportunities are freaks. There simply isn't any market-based reason for most of them to exist. Some, like the Dollar Coin Direct Ship Program, were products of perverse incentives created by the wretched hive of scum and villainy known as the United States Congress. Others, such as the PIN requirement for prepaid credit cards, are the product of presumably well intentioned regulation by the wretched hive of scum and villainy known as the Executive Branch. When an organization decides that allowing those opportunities to continue is sufficiently troublesome or unprofitable, they will go away, e.g. Office Depot's decision to stop allowing credit card purchases of reload cards more than a year ago. As it's been said many times, "if something can't go on forever, it won't." The silver lining is that there will almost certainly be new opportunities. The world didn't end when the Mint stopped selling coins at face value, and it won't end now.